Born during the "Summer of Love" (1967) Chris grew up in the South Bay and began his musical life as a teen ager in punk rock bands, which led to touring the world and intriguing brushes with European law enforcement. Tattoos, also. 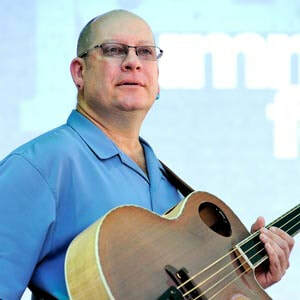 After marriage and ever-so-slight mellowing of lifestyle, Chris realized that 15 years of guitar and bass playing allowed for a variety of musical prowess. He's professionally played jazz, reggae, metal, pop, rap/hip-hop and blues. "There's an authenticity about blues", Chris has said, "that requires a lot more discipline than I at first thought. To play blues bass takes more work than it may sound, and I've learned a great deal trying to get it right...and I'm still learning!" Arsenal, Stikky, The Tweezers, M.D.C., Metallingus, Snakes, Bjorn Baby Bjorn (A Tribute to Abba), The Marginal Prophets, Anxiety, Idol Hands, The Flavor Biscuits , Altered Roots Quartet, Legally Blue. When Chris is not playing bass in Legally Blue, he's running the Valley Medical Center Foundation and serving on the board of San Jose Jazz. He lives in Los Gatos with his wife Kate and many four-legged friends.